Spring is in full bloom over at Guts casino online as they continue to give you even more value for money with 4 blossoming promotions. Last month we told you all about the Guts Spring Festival; whenever you log in there’s a surprise bonus or tournament happening. The festival continues in April and we will be looking at each one, all the terms and whether you should join in. Until the 4th of April: The Tournament Bloom gives you a €$£12,000 leaderboard. So four different promotions, four different amounts of real money prizes, with a total of £€$42,000 given away to Guts mobile casino players in 2 weeks. Let’s take a look and see which of the four Guts promotion give you the best chances of winning. This is a slot tournament, but not in the traditional sense. 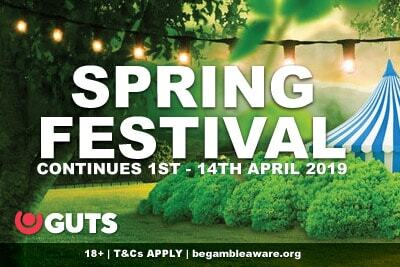 You need to opt into the Guts Spring Festival, but that’s true if you want to participate in all of these casino promotions. The premise is simpler than most tournaments. When on any of the qualifying games you trigger a bonus feature (ie. free spins, re-spins, click me bonus etc…) you’ll get a point. The more points you collect the higher you’ll climb and it doesn’t matter if you are betting 0.10 or 100 a spin. There are 65 real money cash prizes to be won. No wagering requirements – if by the end of the tournament you’ve reached the top 65 players, you get cash into your account. The cash will be in your account within 24 hours of the tournament ending on the 4th of April. Is this Guts casino tournament any good? That depends on how you feel about the Android and iPhone slot games you’ll need to play. The selection is some of the best slots from Pragmatic Play, and if you read our full game reviews, you’ll get a better idea of the style. 7 Piggies slot: our favourite, this volatile machine triggers the free spins surprisingly often. So you’ll have a good time an (hopefully) plenty of points. Wolf Gold slot: this is all about the re-spin and the mega symbols, bringing you some high octane fun. Asgard slot: There are four random bonus features that trigger often and give you heavenly wins. Mustang Gold game: This one is fun, but with a jackpot, the features trigger less often. One for those who want to focus on the game, rather than the points. Great Rhino: our least favourite, taking for inspiration the likes of Raging Rhino, but not executing as well. We’d probably stick with the first four. Time to play some great games and see if you could walk away £€$2,500 richer. This is an unusual casino promotion. On one hand, it looks like a casino raffle: play on slot games and you’ll get raffle tickets where you can win a share of £€$10,000. On the other hand, to get those raffle tickets, you need to complete challenges. By completing these challenges, you’ll climb levels and get yourself some fun free spin and slot casinos bonuses. It’s certainly more complicated than most, but don’t be shy. At the end of the day, it all comes down to the two games you choose to play. There’s only two games for this promotion, so if you don’t like either, walk away and try again another day. 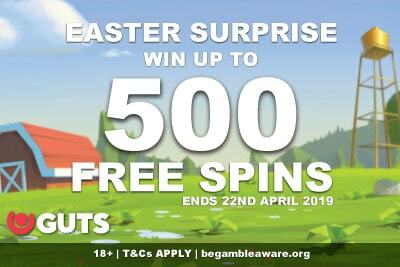 You need to place a minimum bet €$£0.40 per spin on the Eastern Emeralds slot and €$£0.50 per spin on the Big Bad Wolf game to qualify, both for the in-game bonuses and the raffle tickets. When you open up the game, you’ll be given a series of challenges. Level 1 may ask you to hit two 5 of a kind wins for example, while level 2 may ask you to hit the free spin bonus features three times. When you complete a level that’s when things get interesting. Not only will you get a raffle ticket, but you’ll also win either a free spin bonus or a game token. The game token can be exchanged to trigger one of the bonus features within the game. So if you have 6 tokens, you can trigger the free spin slot bonus within the game 6 times in a row. Not a bad reward right? What can I win at each Level? The token can only be exchanged for features within the game you decide to play. So once you’ve started on one, you have to stay committed. Which one do we like better? Well, personally, we think that the Quickspin Big Bad Wolf slot on mobile is a little but more fun, but Eastern Emeralds offer more rewards so… up to you. We should probably also add that anything you win using those tokens or any of the Guts free spins casino bonuses, are free from any kind of wagering requirements. Is the 10,000 raffle prizes worth it? This is a raffle. So anyone who climbs the levels gets a chance to win something, but you could win nothing. Personally, we’d play for the prizes and see if as a nice bonus if, on the 8th of April, you have a little extra in your casino account. A total of 60 prizes will be drawn at random from everyone who has completed at least 1 level on the two games above. 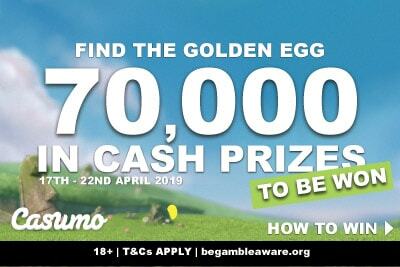 The top amount you can win is £€$2,000 in cash, all the way down to £€$20. You can earn yourself up to 10 raffle tickets between the 3rd and 7th of April. Another week, another slot tournament! Only this time around, you get to play on some of our personal favourite games, and you have a choice of multiple Play’n GO tablet slots to pick from. This is a far more traditional tourney, in as much as you need to just get either a three of a kind win on one of the mid-pay symbols to get 3 points or trigger the free spins to get 10 points. As usual, we will be looking at each of the games, and which is likely to give you the most fun and points. Which video slot should I play? We are actually fans of all the slots on the list, but here’s how we would start playing in order to get points. Because you can get more points by hitting the free spin bonus feature, we will mostly focus on that. Cash Vandal slot: Brand new, travel to four different locations via the free spins for some volatile and fun wins. Banana Rock game: time to monkey around with some funky apes who are all about giving you a rocking good time. Golden Colts online slot: The free spins are not as easy to trigger as the other two above, but it hides enough surprising wins to make up for it. Raging Rex video slot: with 4096 Ways to Win this volatile game may not give you the most points, but you might land some meteoric size wins. Queens Day Tilt mobile slot: set on a 3×3 grid, this is a surprisingly fun game that is more than just about the bonuses. Not to be played for points though, as a 3 of a kind win is the highest possible win and the free spins are not as common as some of the others on this list. That said, if you only want to try one game, Banana Rock would be our number one choice and it has a low minimum bet of 0.10 a spin. Fans of Yggdrasil slot games should just opt-in and get playing because the last of the Guts Spring Festival promotions will be randomly raining showers of cash on some of their most popular Yggdrasil games. 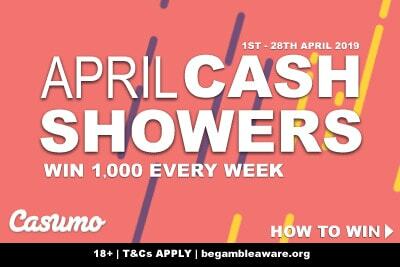 This is by far the simplest of all the offers: play on a slot with a minimum of 0.20 a spin, and at any point this week you may randomly be rewarded with more than one of the 92 cash prizes. The games in questions are: Vikings Go Berzerk, Vikings Go Wild, Holmes And The Stolen Stones, Valley Of The Gods, Vikings Go To Hell, Hanzo’s Dojo, Sunny Shores, Jungle Book, Spina Colada, Reptoids, Golden Fish Tank. So lots to pick from. Some of our favourites have to be the original Vikings Go Wild slot, the strangely compelling Hanzo’s Dojo game and the crazy bonus heavy Jungle Book mobile slot. There are multiple prizes available, and all will be given as cash prizes at some point between the 11th to the 14th of April. There are no limits to the number of prizes you can win, though if you win one you’ll be feeling pretty lucky. It’s a nice way to end what has been a bonus-filled springtime over at the Guts casino. You know what they say; April showers bring May flowers. And if you win any of these cash prizes, you’ll be able to buy yourself plenty of flowers to bring a little springtime to your home. The good news is that you can play on any of these promotion using real cash or bonus cash. Either way, every bet counts towards getting your closed to one of these great casino prizes. Here at LuckyMobileSlots.com, we review slots, promotions and casinos, to make sure you have the best possible time gambling online. And Guts has a generous welcome bonus to get you started, always there to give you more bang for your buck, with free spins, deposit offers and more. Time to spring into action.